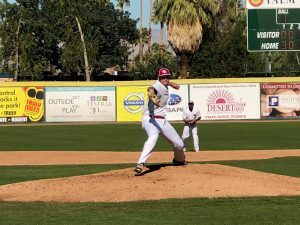 PALM SPRINGS, Calif. — The Palm Springs Power is a staple in the Coachella Valley area, as the organization boasts eight Southern California Collegiate Baseball League (SCCBL) titles dating back to 2007. The Power enjoy playing in front of healthy crowds at historic Palm Springs Stadium in the summer, but manager Casey Dill’s squad is also one of 10 teams that play there in the winter. In his fourth season as a manager in the California Winter League (CWL), Dill understands he has an influence on the futures of players participating in the month-long showcase. At the same time, as a manager, it is difficult to put his competitive streak on the back burner. The challenge is finding a healthy balance of allotting appropriate exposure for his guys, while also trying to win. The Power traditionally have success during the California Winter League and this year is no different. Palm Springs is off to a healthy 3-2 start and sit a half-game behind first place Washington after a full week of competition. Already, Dill, who is an associate scout for the Atlanta Braves as well as a scouting and acquisition coordinator for the Southern Illinois Miners, filtered four members of the Power on to the Frontier League. Left-handed pitcher Kyle Brown, right-hander Noe Artega, second baseman Jake Willsey and shortstop Cletis Avery signed contracts to join Dill’s Miners once the 2018 CWL season concludes. For Dill, the process was exhaustive. “It’s not just helping guys get to the next level, it’s also finding the right guys that are going to help us win baseball games,” Dill stated. “The scouting process for us began back in September. We’ve been following the four particular guys we’ve signed for several months now. Willsey and Avery are a combined 9-for-31 (.290) with two doubles, a triple and a home run in the CWL. Kyle Brown has dominated opposing hitters, as the left-hander has allowed a mere three hits with 11 strikeouts in eight scoreless innings of work. Arteaga, to his credit, has struck out nine in four innings pitched. The Frontier League recognizes the CWL as their official winter baseball league and are taking full advantage of the 200-plus players who enlisted to play in 2018. Four Frontier League teams are represented in Palm Springs this winter, while eight players have officially agreed to play in the competitive aforementioned independent scene. For Dill, scouting the same players as his counterparts creates an interesting dynamic. The ultimate conclusion, though, relates to assisting all parties involved to be the best they can be. “It’s kind of like a fraternity,” Dill said regarding the plethora of professional scouts present at the CWL. “Everybody is friends with everybody. It’s an open line of communication amongst all coaches. With just under three weeks left in the 2018 California Winter League, managers and scouts have ample opportunity to fill the needs of their respective clubs. As for the Power, four players have already signed and several more are expected to find a summer home professionally before it is all said and done. Palm Springs collective ERA as a pitching staff stands at a healthy 3.29 in 34 innings. Offensively, there is no shortage of power for Dill’s group, as his team ranks second in doubles (11) and second in home runs (two). The California Winter League playoffs begin on Thursday, February 15. The championship will be held on Sunday, February 18 at noon.